"A fast, exhilarating read [...] the kind of old-fashioned adventure I didn't think we were allowed to write anymore, of freebooting privateers making their haphazard way in a wondrous retro-future world." So, yeah, a lot of fun. That's the best way I can describe the experience of reading this book. It's fast-paced, high-octaned, unpredictable, and fun. The last ten chapters are un-put-down-able. The Ketty Jay is a beloved cargo fighter craft belonging to an extremely unfortunate part-time pirate captain, Darian Frey. The story starts off on the wrong foot for Frey as he is captured and held at gunpoint due to a "small misunderstanding." Unfortunately, things don't get any better for Frey or his ragtag crew as the story progresses. They literally fly from one disaster to another, just barely skirting bullets and explosives enough to save themselves and the Ketty Jay. As a captain, part-time pirate and full-time freelancer, Frey is terribly unfortunate. He's being sought after by the authorities (Century Knights), various scorned thugs (that's why he has to avoid certain cities and ports), and a relentless mercenary to whom he may or may not have personal ties. As much as Frey and his crew try to stay out of trouble and fly under the radar, trouble and the people looking for them always find them just in time. It's a mess, but a fun mess. On top of all of this, Frey and Co. are hired for a risky job only to be framed afterward. And so they go on the run. Again. Just when things couldn't possibly get any worse they stumble on a conspiracy plot. Pieces of the puzzle gradually fall into place, and the reason they were framed start making sense. It's only when they set out to clear their names once and for all do they have luck and good timing on their side. I still can't believe this book isn't on TV yet. It's got all the elements of a rollicking drama: adventure, conspiracy, piracy, dodgy aircraft, dogfights, alchemy, necromancy, tortured characters, sly historical references, a whole world that still needs exploring, and of course, weird technology that comply with weird physics. On second thought, I'm glad it's not on TV. The last time something like this was on TV it was canceled almost immediately. A lot of reviewers compare Retribution Falls to Joss Whedon's famously canceled TV show Firefly, and I can see how they made that connection because both are similar in tone, setting, and genre, but that's where the similarities end because Retribution Falls is a balanced mix of science fiction and fantasy. The magical elements aren't explored as much as the technological elements in this book, but they're featured enough to show that both do exist, in their various forms and factions, in the world of the Ketty Jay. I don't remember this world having a specific name, so I will refer to it as "the world of the Ketty Jay" since most of the action happens in and around the spacecraft. Not exactly steampunk, although it's very similar in tone. The machines and weapons described are too intricate and advanced to be steampunk, and so far nothing in this book runs on steam. So there's that. I think the supposed time period is best described as a Victorian version of a far off future. Victorian space opera, perhaps? 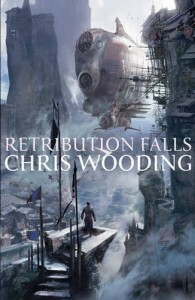 Chris Wooding is a surprisingly good prose writer. I don't mean that as a backhanded compliment. I mean I'm genuinely surprised by his skills--again, not meant to be backhanded. He's good in a subtle kind of way that sneaks up on you when you find yourself invested in the story. Not many genre authors and even fewer steampunk authors are known for their prose prowess. Crafty plotters, cunning character writers, and technologically competent describers aren't usually skilled prose writers. Not saying these authors don't exist; just saying it's not often you come across one when reading genre fiction. Wooding is an exception though. I went into this book expecting a fun action-packed story. What I got is exactly that and a lot more on the side. "You just hypnotized a man with your tooth, Crake. Don't talk to me about impossible." There was a wildness here that he found frightening. It was a jostling, stinking pandemonium of rotted teeth and leering faces. Danger surrounded them. He found he actually missed the specter of the militia. He liked his illegal doings to be conducted within the safety of an orderly civilization. Total lawlessness meant survival based on strength and cunning, and Frey didn't have too much of either. But a craft was nothing without a crew to operate her and pilots to defend her. A craft was made up of people. The Ketty Jay was staffed with drunkards and drifters, all of them running from something--whether it be memories or enemies or the drudgery of a land-bound life--but since Yortland, they'd been running in the same direction. United by that common purpose, they'd begun to turn into something resembling a crew. And Frey had begun to turn into someone resembling a captain. He was tired. Tired of struggling against the grief and shame. Tired of living under the weight of one arrogant mistake, to think that he might summon one of the monsters of the aether and come away unscathed. Tired of trying to understand that awful twist of fortune that had led his niece to his sanctum on that particular night, instead of any other. Leave her here, amid the ash and dust. If he didn't wake her up no one ever would. Let her sleep, and perhaps she'd dream of better things.